For more information about the Caughlin Ranch Community Yard Sale call 775-746-1499, Caughlin Ranch Home Owners Association, CRHOA, and give them your address to register for the for the annual community yard and garaged sale.CRHOA publishes a flier for the Garage Sale that can be picked up at the CRHOA office, 1070 Caughlin Crossing, the Friday before the Community Yard and Garage Sale. If you are having a yard sale, this is a great time to donate what does not sell to Catholic Charities of Northern Nevada: The St.Vincent Programs. Just call 775-746-1499 to setup pickup on Saturday or Sunday. The garage and yard sale will be on Saturday and Sunday, October 6th & 7th. On Saturday, stop by our garage sale at 3108 Sweet Clover St., Reno, NV 89509 and meet Bill and me. We will be finishing up on our fall cleaning, and opening up an additional parking space for a 3rd car. When you call CHRHO office, you can register for the donation pickup. Considering buying or sell your home in Caughlin Ranch? MSNBC reporter Jacob Rascone was in Reno this past summer and met with Congressman Amodei and Mayor Hillary Shchieve to talk about our great bounce back. The conversation with Mayor Hillary Schieve about how our economy has diversified brings to light how it has changed to help the city rebound from a deep recession. The quality of life in Reno is wonderful. Our taxes are some of the lowest in the United States and recreation is in our backyard (Truckee is 30 miles away). The Conrad Team (Karen and Bill Conrad) are proud to be sponsors of this year’s 2018 RMC Washoe County Sheriff’s Debate. We are committed to providing information to help inform the voters of Washoe County and we will provide transcripts of all interviews from Meet the Voter. In order to be safe in our community, public safety must be the first responsibility of local government. Please study the candidates and vote for the person who you believe will best serve and protect the citizens of Washoe County. This immaculate 3 Bedroom, 2.5 Bath home with approximately 1845 square feet of living space is located across from Summit Ridge Park. With magnificent mountain and city views of Reno, this home brings out the best in residential living in our community. This great location is close to shopping, the University of Reno Nevada (UNR), downtown, I-80 and it’s just a short drive to the Tahoe Reno International Airport, the Truckee River, and the Sierra Mountains. This distinguished home designed by Gail Richie and built by Homecrafters is located in Caughlin Ranch Estates. It is close to shopping, schools, and mountain walking trails. With over 4100 square feet of living area, this home has four bedrooms, plus an office, 4 1/2 bath, a formal living, and dining area. The daylight basement has a built in bar, bedrooms, and a bonus room which opens to the yard. Enjoy cooking in this gourmet kitchen with a gas range, double oven, granite countertops, cherry cabinets, a large island with sink and a walk-in pantry. The kitchen overlooks the spacious family room which has wood floors, built in cabinets and a cozy fireplace. Relax in the master suite with a see through fireplace which opens to a deep soaking jetted tub. The master bathroom has a separate shower, double sinks, and his and her walk-in closets. Entertain your family and friends out on the deck which has a view of the city. 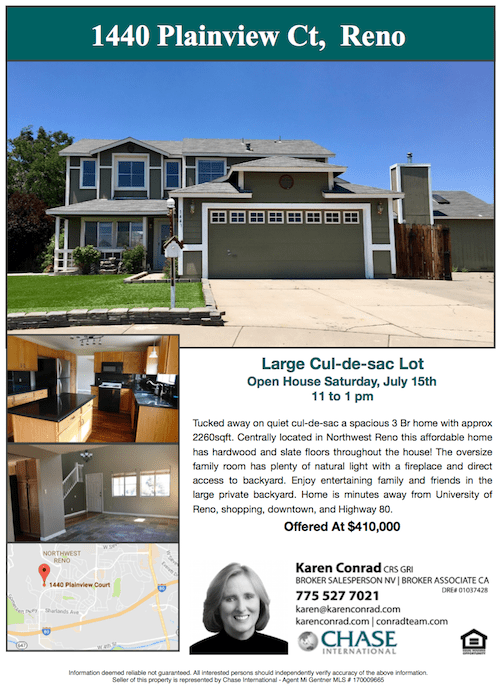 Come out and see this beautiful home. Tucked away on a quiet cul-de-sac this spacious 3 bedroom 2 1/2 bath home has approximately 2260 square feet and is centrally located in North West Reno. This affordable home has hardwood and slate floors throughout the house! The oversized family room has plenty of natural light with a fireplace and direct access to the backyard. Enjoy entertaining family and friends in the large private backyard. This home is minutes away from University of Reno, shopping, downtown, and Highway 80. For more details and time on the open house at 1440 Plainview Ct., in the Biggest Little City, Reno, Nevada.